On Thursday, 28th March, our musical director Eleanor Kelly will be playing together with the Woodside String Quartet as part the Angel Field Festival. 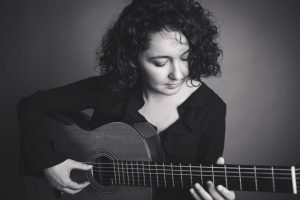 They will present a programme of South American music for classical guitar and string quartet, with compositions by Astor Piazzolla and Claudia Montero. The concert will include the UK premiére of Montero’s piece Luces y Sombras. The concert will take place at the St Francis Xavier’s Church, Salisbury Street, Liverpool, L3 8DR at 7:30 pm. Please not that we will not hold a player’s evening on this day to allow everyone to attend the concert.